1 Shred cabbage, cut tomatoes in quarters, and peel and cut potatoes in quarters. Heat ghee or oil in a skillet. 2 Over medium low heat, add potatoes and fry until lightly browned. This will take atleast 10-15 minutes. 3 Add cabbage, ginger, turmeric and red pepper, stirring gently. 4 When cabbage is cooked for 5 minutes Add tomatoes, sugar, and salt. 5 Cover and cook over low heat for 10 minutes or more. 6 Just before serving, sprinkle with cloves. 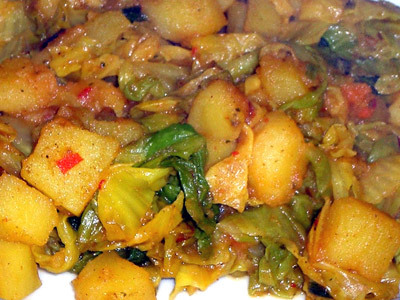 For low calorie Bengali cabbage substitute amount of ghee with half the amount of oil.